With nearly 30 years of experience handling commercial and personal injury litigation, Mike represents hospitals and health systems, nursing homes, long-term care facilities, medical device manufacturers and mail-order pharmacies. Securing a complete dismissal with prejudice for the chief medical officer of a public hospital after six years of protracted and contentious litigation. Defending breach of contract action brought by former hospital chief executive officer. The matter was resolved before trial. Defending manufacturer of Sharps container and transporter of medical waste in action filed by a physician’s assistant who was pricked by a needle. The matter was resolved before trial. 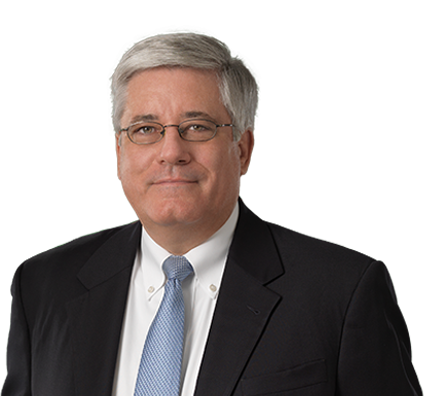 Mike advises business clients in the areas of Employee Retirement Income Security Act (ERISA) and other benefit claims, first-party insurance, lender liability, construction, hospital executive separation and fiduciary duty issues. In addition, his complex product liability and toxic tort litigation has involved strict liability, failure to warn, breach of warranty and other related claims. Mike also has handled commercial and personal injury litigation, as well as class action and multidistrict litigation. He is a certified Rule 31 mediator within the Tennessee judicial system. Mike is the Managing Partner of the firm’s Chattanooga office. Defended breach of contract action brought by former hospital chief executive officer. The matter was resolved before trial. Defended manufacturer of Sharps container and transporter of medical waste in a “fear of acquired immune deficiency syndrome” action filed by a physician’s assistant who was pricked by a needle. The matter was resolved before trial. Assisted with the representation of numerous multidistrict product liability actions involving contraceptives. Some matters were dismissed on motions and others were resolved before trial. Defended a pharmaceutical company in a wrongful death product liability action arising from an overdose by a minor. The matter was resolved on the eve of trial. Defended manufacturer of animal vaccines in product liability actions. The matters were resolved before trial. Represented several nursing home entities in patient actions arising from injuries and/or deaths. The matters were resolved before trial. Defended manufacturers of surgical stools, physical therapy machines, infant intravenous (IV) needles and catheters, forceps and other medical devices in product liability actions. Some matters were dismissed on motions and others were resolved before trial. Obtained summary judgment on behalf of a pharmaceutical company against a Title VII claim for race and gender discrimination. Represented one of the world’s largest automakers in a product liability action in which the plaintiff suffered serious and debilitating injuries from alleged carbon monoxide poisoning. The U.S. District Court ultimately granted summary judgment to the client on statute of limitations and incompetency grounds. Assisted with the representation of a tank car manufacturer in a complex product liability action involving a leak of arsenic acid at a rail yard. A favorable settlement was reached after months of investigation and years of litigation with the client’s co-party and indemnitor. The client was ultimately voluntarily dismissed before retrial of the action. Obtained summary judgment on behalf of a large publicly owned provider of electric power on statute of limitations and contractual limitations of liability grounds.